Gameplay of DK Attack in the level Trick Track Trek. DK Attack is a time attack mode in Donkey Kong Country's Game Boy Advance remake. 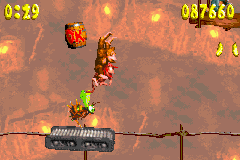 The mini-game's objective is for the Kongs to complete a level and score as many points as possible. The Game Boy Advance remake of Donkey Kong Country 2: Diddy's Kong Quest has a time attack mode called Diddy's Dash, which is loosely based on DK Attack. After selecting a level, Donkey and Diddy start off with a time limit of one minute. The Kongs must rush through the level, gain time bonuses (indicated with a simple "+5", "+10", and "+20". ), and reach the end before the timer reaches zero. Points are earned for getting bananas, K-O-N-G Letters, Extra Life Balloons, freeing Animal Buddies and defeating enemies. The amount of enemies defeated in a row allows the score to be multiplied by the amount defeated for each cumulative enemy (x2 for the second enemy, x3 for the third, etc.) Points are needed to get a high ranking. The game then tallies up the points and rates the player on a ribbon scale of "D" through "S", with "D" being the lowest and "S" being the highest, just above an "A" rank. Through exploiting the system where bonus rooms reset each time they are entered, a max score can be obtained in certain levels by continually increasing the time. The base score is limited to 500000 at which point it turns into a blinking yellow text displaying "Max Score". The time is also limited, not increasing after a time of 2:59 is reached. If the level is ended with max score and close to max time, the variable which saves the score can be overloaded and restart from 0, making a potentially high score turn into an extremely low score. This limit is 655360, and when a higher score is earned, it will save as an extremely low score, the difference between the score and 655360. Enemies provide points when they are defeated. If multiple enemies are defeated in a row, either through a continuous roll or jump, each enemy will get a multiplier to its score depending on when they were defeated in the combo. For example, if a purple Kritter and two Armies were jumped on, the first Kritter would add its normal score, 2500 points, the first Army would get a x2 multiplier to its score, yielding 11000 points, and the second Army would provide a 3x multiplier to its normal score, adding up to 16500 points, for a total score of 30000 for the combo. * Does not apply for Klap Traps found in "Bash the Baddies" bonus levels. This page was last edited on September 28, 2018, at 07:28.